Concerning anchors. – Dirty wet dog , boats and sailing. I guess this post will be one of several about anchors and anchoring as like many small boat cruising sailors i would much rather be at anchor than in a noisy and expensive marina. I come from a racing background and hadn’t actually ever anchored a boat overnight ever in fact my entire anchoring experience up until setting off on a cruising circumnavigation was really just kedgeing during a race on a foul stream and most often with under-powered and under weight anchoring gear…no surprise then to have under-weight anchors just bouncing along the bottom in both north wales and the solent !. With my own boats i suddenly became a lot more interested because the kind of sailing i wanted to do was firstly a lot more adventurous : i wanted to get into the wilder places and i knew by then that i pretty much detested most modern marinas. This post then really concentrates on my own series of 5 cruising boats and their set-ups and then some experiences from other boats that i have anchored. All of my boats except my failed dinghy project have been in a similar size range ie 22 to 26 feet and a weight range of just over 1 ton and up to about 4 tons. The overall approach that i have taken is to set my boats anchoring gear up in the same or similar way that RNLI offshore boats used to be set up ie anchor type = Delta and chain/warp combination which i feel gives value for money anchoring power which is reliable and the chain/warp combination to give adequate catenary and chain on the bottom to give less chafe in the rode. The difference is that i try and stow my anchors well back from the bow. The boat that taught me more about anchors and anchoring was my Frances 26 and the photograph above shows an early version of what became my eventual set-up. The Frances was great for its huge slightly sunken foredeck : much wider than any race boat i have ever sailed on. The 2 anchors there are both Lewmar ‘Delta’s’, both at 10kg although soon after this picture was taken i invested in a 15kg Delta which became my primary ‘best bower’ anchor and from then on was what i used. That might seem massive overkill : 35 pound anchor on a 26 foot boat but the difference was the feeling of total confidence that it gave me, the second delta then became either a lunch-hook/kedge or the stern anchor in a bahamian moor. I did also have a dedicated rock pick stowed below, like a fisherman but with a much heavier stock and wider flukes (wish i still had that one) specifically for rock/weed bottoms and intended for some of the difficult scottish and brittanny anchorages. 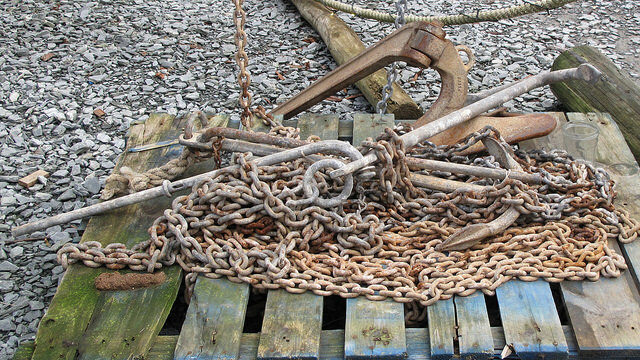 Both primary anchors are set up with chain and warp : the bower anchor with 2 X boatlength of 8mm chain , therefore about 15 metres and a 100 m warp to back it up. The kedge/stern anchor got a tail-end of just 5m of chain and a bag of weighted warp (30 meters from memory) but i did have a spare 75 metre warp stowed below. I also had a 16 lb kettlebell on board as an anchor angel which i had found useful to stop the Frances dancing around so much. The next crucial thing about anchors is how i carry them : on the Frances as above they are both well back from the bow and stowed on chocks, i never thought much of the standard CQR chocks so eventually made my own from cast alloy cleats that had eyebolts replacing the standard fastennings and had decent lashings from those. Both anchors had their rodes led in such a way that when stowed in that position all i would have to do is walk forward and toss one of the anchors overboard if i had to anchor quickly. A lot of the time i would just have one stowed over the bow roller when local cruising but i was obviously either just going somewhere or coming back from somewhere when that picture was taken. In a similar vein is this stowage with the Bruce/claw when i was experimenting with it with the blades stowed over the gunnel on a custom chock. I don’t remember now which size that was, it looks like the 10kg claw but i did have a 15kg claw for a while until i rejected the type completely as being generically under-effective on several boats. Something that the frances taught me is that having a sailbag forward as i do : the genoa in the bag is permanently hanked onto the forestay is that it is the extra windage forward that creates a lot of the problem of the boat shearing at anchor and quite early on i experimented successfully with the 16 lb kettlebell used as an ‘angel’. Up until very recently i was generally settled with the Delta type as my main anchor and chain/warp as my rode. My chain rode combination with the Frances was 2 x the boatlength of 8mm chain, less now with the Liberty as i had to use a scrap end of about 8 metres but still 8mm which is most likely both too heavy and not enough of it because the liberty really does want to dance over its anchor : again i suspect that its the windage of the main mast forward causing the problem. The liberty came with what i feel was an inadequate anchor : a 6kg CQR (plough) with about 5 m of 6mm chain and about 30m of 10mm 3 strand warp. Using that set-up for my christmas cruise and i dragged most definitely !. The normal set-up on the liberty is all stuff kept from previous boats ie an 8kg delta, about 8m of 8mm chain from a scrap end and the 75 metre reserve warp which didn’t go with the Frances. Predictably that never failed or dragged but did create the problem i realise now of far too much weight forward when sailing as the tiny anchor well is all the way at the bow and the anchor is almost forward of the waterline when stowed in its bag…thats a lot of weight too far forward on such a small boat. Anchored in the Odet-Fleuve on the 15kg Delta, chain and warp. Anchor down and balls up ! When i bought the Liberty the former owner admitted that amongst other things he had never anchored the boat and i think that the anchor gear bore that out : what i believe was an under sized hook, short chain and a short un-marked warp. I suspect that the boa may have had better kit under its first owner or maybe just never anchored seriously. Ok so a 14 lb plough type should hold a 1 ton boat in easy tidal conditions and not much breeze but that is too many shoulds, ifs, buts and maybe’s for me. I immediately changed up the gear i had lying around ie the 8kg delta type, short but heavier chain and lots of warp. I never once had any problem with that except for 2 things : first that its too much weight forward when making upwind in a breeze and waves and secondly that going forward on the liberty is basically awkward with the narrow side decks, low guardrails and a light tippy boat. If you follow the thread then you will learn that one instance of going forward to reef nearly had me overboard so the systems i am developing now include a ‘lines aft’ approach and a stern deployed bow anchor. My brand new anchor is a 7kg Rocna (super expensive) and a lead weighted warp….i am though waiting on funds being available to buy a length of very high strength 7mm chain and as with previous boats will have about 15m of that first. Once i have the stern stowed and deployed anchor working i shall report back.